St. Augustine. America’s oldest city—and perhaps its most haunted. Why is it so ghost-ridden, so filled with spirits? 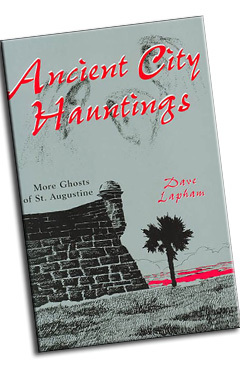 Since the release of Dave Lapham’s first book, Ghosts of St. Augustine, the Ancient City has been the subject of numerous television documentaries and paranormal investigations. Ghost tours have burgeoned. Few have been disappointed in their quests for supernatural experiences. Come walk again with author Dave Lapham through the dark, enduring streets of St. Augustine and shiver in the ice-cold pockets of air that smother you in the black of night. Listen to the gentle lapping of the water along the bar front and the distant murmurs of French sailors being slaughtered on the river. Come visit the Oldest House, the Old Jail, Ripley’s, the Oldest School Hose, and all the may haunted B&Bs and other establishments that harbor wandering souls and spirits from ancient times.